Prohibition of women entry is a form of untouchability. The sole basis of restriction is menstruation of women. To keep away menstruating women is a form of untouchability. Menstruating women are seen as polluted”, submitted Indira Jaising. The arguments for the day were started by Advocate Ravi Prakash Gupta for the petitioner, Indian Young Lawyers Association. He began by attempting to narrate the historical background of the temple, even hinting that the temple was of Buddhist origin. However, the bench did not express much interest in the historical arguments and instructed him to stick to the points under reference. Then, Gupta advanced arguments to the effect that Sabarimala temple could not claim the character of an independent religious denomination. One of the questions referred to the Constitution Bench is whether the Ayyappa Temple at Sabarimala, by itself, could claim the status of a “religious denomination” within the meaning of Article 26 of the Constitution of India. Article 26 of the Constitution guarantees religious denominations fundamental rights to manage their own affairs, acquire and administer properties etc. The legal implication of Sabarimala temple being a “religious denomination” will be that it will be entitled to preserve its own unique and distinct rituals and practises. To drive home the point that Sabarimala temple cannot claim the status of a “religious denomination”, Gupta referred to Shirur Mutt Case (AIR 1954 SC 282), where the attributes of the religious denomination were discussed. Some of the attributes of “religious denomination” are:- 1) Having its own property 2) District Identity 3) Having its own set of followers 4) Distinct set of practises and beliefs 5) Its own hierarchy of administration without external control and interference. Gupta also invited attention of the bench to SC decision in Sri Venkataramana Devaru v. State of Mysuru AIR 1958 SC 255. There, the SC was considering the issue whether the right of a religious denomination to manage its own affairs in matters of religion guaranteed under Art.26(b), is subject to, and can be controlled by, a law protected by Art.25(2)(b), throwing open a Hindu public temple to all classes and sections of Hindus. A temple belonging to Gowda Saraswat Brahmins had the status of a “religious denomination”. A law was passed by the State pursuant to Article 25(2)(b), throwing open the temple to all sects and classes of Hinduism. When this law was challenged as infringing rights of denomination under Article 26, the SC held that the rights of Article 26 can be overridden by law passed under Article 25(2)(b). Relying on this decision, Gupta submitted that women can be permitted to enter Sabarimala, de hors customary traditions. Further, Gupta submitted that prohibition of women entry was against the essence of Hinduism. He pointed out that women were reluctant to visit the temple in past due to physical hardships involved in climbing the hill, and also the risks of travel through forest. “The restriction was due to practical considerations, and not based on tradition”. He also added that the vow of celibacy of 41 days taken by Ayyappa devotees was not an essential religious practise. Further, Gupta submitted that the temple was controlled by Dewaswom Board, which was a state instrumentality created under the Travancore-Cochin Hindu Religious Institution Act, and was maintained by public funds. Therefore, the temple cannot practice gender-based discrimination, as it would be violative of Articles 14 and 15 of the Constitution of India. Prohibition of Women Entry a Form of Untouchability- Indira Jaising. Senior Advocate Indira Jaising, appearing for an intervenor, led arguments in the post-lunch session. Her arguments were centred on Article 17 of the Constitution, which banned practise of untouchability. “Prohibition of women entry is a form of untouchability. The sole basis of restriction is menstruation of women. To keep away menstruating women is a form of untouchability. Menstruating women are seen as polluted”. At this point, Justice Chandrachud intervened and indicated that Article 17 may not be applicable as it was not dealing with gender-based discrimination. Chandrachud,J said that Article 25(2)(b) could be of more assistance, as the phrase “sects and classes” therein will cover Hindu women. But Jaising persisted with her arguments on Article 17. “What is good law for Harijans is good law for women as well”, she said. At that juncture, Justice Nariman also echoed the views of Justice Chandrachud, and said that denominational rights under Article 26 can be harmonized with rights under Article 25(2)(b) as settled in Devaru (supra) decision. 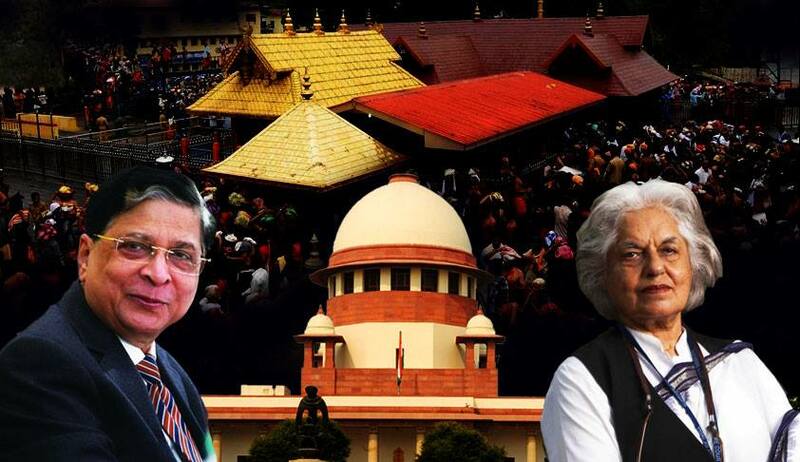 Jaising further submitted that it was immaterial whether Sabarimala temple was a “religious denomination” or not, as a woman had right to enter the temple as per Article 25. “There is nothing in health, morality or public order to prevent a woman from offering worship in a public temple”, she submitted. In the meanwhile, a significant development occurred, when the counsel for State of Kerala, Senior Advocate Jaideep Gupta, informed the bench that Kerala was supporting entry of women of all age groups in Sabarimala. The bench expressed that Kerala was changing its stand for the fourth time in the matter. Article 25(2)(b) a substantive right, not an enabling provision- Raju Ramachandran. Senior Advocate Raju Ramachandran, who has been appointed as amicus curiae in the matter, submitted that Article 25(2)(b) was not a mere enabling provision which permitted enactment of law to make Hindu temples accessible to all sects and classes, but granted a substantive right. The right of women to enter temple and offer worship flowed from Article 25(2)(b). He also submitted that the restriction had the effect of invading the privacy of a woman, as a woman making pilgrimage to the temple was making an involuntary disclosure that she was not menstruating. At this juncture, the bench examined the notification issued by the Devaswom Board, which stated that women between the age of 10 and 50 years were prohibited from entering the temple. “Is menstruation the basis of age prescription? Does the notification leave out a 9-year-old or a 53-year-old who could be menstruating” the bench asked. Justice Chandrachud openly remarked that if the basis of age prescription is menstruation, then the notification will be violating constitutional morality.